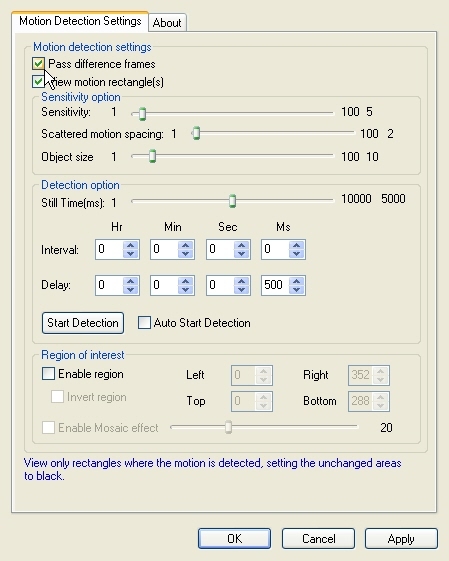 The Motion Detection property page provides a user interface for changing the filter's attributes. If selected, the unchanged area is replaced with black. The areas containing the motion will remain unchanged. If selected, a white rectangle will be drawn around each area where motion is detected. Sets the Motion sensitivity. A small value specifies high detection sensitivity. A large value specifies low detection sensitivity. Sets the maximum space between the boundaries of objects to be joined in a single object. This is a percentage of the maximum expected distance between two objects. Valid values range between 1 and 100. Sets the minimum size an object must have in order to be considered an object. The size is a percentage of the video size (width and height). Sets the minimum duration for still periods (in milliseconds). A still period of at least this duration is required before motion is considered to be stopped. All periods without movement shorter than the minimum still time will be considered part of the motion. Use this to keep short periods of inactivity as part of the motion. Sets the time, in hours, of the delay time between checks for motion. Sets the time, in minutes, of the delay time between checks for motion. Sets the time, in seconds, of the delay time between checks for motion. Sets the time, in milliseconds, of the delay time between checks for motion. Sets the time, in hours, to wait after motion detection is triggered, before motion detection actually starts. Sets the time, in minutes, to wait after motion detection is triggered, before motion detection actually starts. Sets the time, in seconds, to wait after motion detection is triggered, before motion detection actually starts. Sets the time in milliseconds, to wait after motion detection is triggered, before motion detection actually starts. Starts or stops the motion detection manually. If selected, the motion detection process will start automatically after the delay time. If selected, the motion will be detected within the specified region. If selected, the motion will be detected outside the specified region. Sets the Left region coordinates. Sets the Top region coordinates. Sets the Right region coordinates. Sets the Bottom region coordinates. If selected, the mosaic effect enabled on the non-region of interest area.